Microplastics, microbeads, microfibers…You might have heard of them, and you probably know they’re not great. But, what really are microplastics, and how can we limit the amount of microplastics that we bring into our lives–and our ecosystems? Read on to get all the details on these macro-menaces, and how you can reduce your microplastic footprint! Microplastics: as their name suggests, this word refers to any small plastic pieces less than 5mm long (roughly the size of a sunflower seed); and includes microbeads (manufactured round pieces of polyethylene), as well as synthetic microfibers from non-organic materials like nylon. 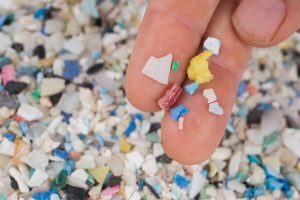 Microplastics can either come from larger pieces of plastic beginning to break down into smaller pieces, or, like microbeads, be intentionally manufactured for use in various products. Another major source of microplastics come from our clothing, and are often referred to as microfibers. Lots of conventional clothing contains non-organic, synthetic threads that come loose in the wash, pass through filtration systems, and heading to our waterways. No matter what type of microplastic it is, these nuisances are bypassing filtration systems and ending up in our oceans. From there, the pieces are being ingested by aquatic and marine life…which, in many cases, are eventually consumed by us! Whether you’re looking at the impacts of microplastics on our ecosystems, or our bodies, the result is the same: something needs to be done to mitigate this problem before it gets even worse. 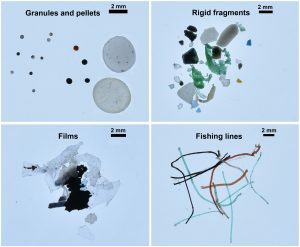 Beyond the quantity of microplastics in the ocean comes another problem: they are literally everywhere. Studies have found microplastics inside of animals that live in the Mariana Trench, a 7-mile deep spot that is known as the deepest point in our world’s oceans, as well as inside of animals who live in shallow tide-pool ecosystems. These microplastics can block digestive tracts, diminish the urge to eat, and reduce reproductive behavior. The problem is so bad that recent reports say plastic pollution will outweigh fish in the oceans by 2050, due in part to the 8 million tons of new plastics that are dumped into our waterways every year. Yikes. Larger pieces of plastic, aka non-microplastics, are known for killing or suffocating the animals they come in contact with. Remember the recent story of the whale filled with plastic bags, or the sea turtle with the plastic straw stuck in his nose? But small, nearly invisible microplastics can often be ingested without immediately impacting the creature who consumed it, which means microplastics are more likely to travel through the food chain, leading to something called bioaccumulation! Plastic pellets are highly absorbent, and can collect persistent organic pollutants (POPs); aka hazardous human-made chemicals that are also poured into our waterways and oceans. 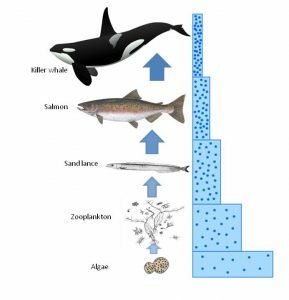 When animals ingest the combination of microplastics and POPs, the chemicals begin to accumulate in the fatty tissues of marine animals. Over time, these chemicals can cause cancer, malformation, decreased immunity to disease, and impaired reproductive ability in their host animals. Beyond the ability of plastics to attract POPs, many microplastic pieces already contain their own chemical additives like BPA, phthalate plasticizers, flame retardants, and more, all with their own slew of long-term health impacts. When an animal containing these particles and chemicals is consumed by another animal in the food web, bioaccumulation ramps up even more. Think of it this way: if a whale eats 1,000 plankton a day, and each plankton contained .5 grams of plastics, now the whale has 500 grams of plastic particles inside of it. The whale is unable to metabolize and excrete these toxins, so it accumulates inside them. This is a major problem, not only for animals, but for humans, as we are at the top of the marine food web and consume a wide variety of marine species. A recent report by the United Nations Food + Agriculture Organization has found that people do consume trace amounts of microplastics from aquatic life. Luckily, we don’t consume nearly as much as other animals due to the fact that humans really only eat the muscle tissue of animals, leaving out the guts of fish, where the bulk of microplastics and chemicals accumulate. But, this doesn’t mean there isn’t a problem! Microplastics over time become “nanoplastics”, which are almost invisible pieces of plastic. These nanoplastics can penetrate cells, and move into tissues and organs, and their effects have been relatively unstudied. The truth is, it’s difficult to pinpoint exactly what microplastic accumulation is doing to us. Part of this is due to the fact that we’re so highly exposed to chemicals and plastics that it’s hard to separate each cause and effect. Plus, running tests on humans is difficult due to our longer life-span than many marine animals, so tests require more time to analyze the long-term health impacts. But we think it’s pretty safe to say that reducing your exposure to microplastics and their associated toxins can be nothing but good for you. Microplastics, although they’re making waves in recent news, are not a new problem. Plastic microbeads first appeared in consumer goods about 50 years ago, as companies began to shift away from organic ingredients. Flash forward to 2012, and most consumers were still unaware of the prevalence of microbeads, partially because companies were not required to disclose if their products contained them (crazy, right?). Despite a general lack of awareness, in 2015, President Obama signed the Microbead-Free Waters Act of 2015, which banned plastic microbeads in cosmetics & personal care products. But this is only half the battle. Microbeads are just one source of microplastic pollution, and are easier to tackle because they can be banned through legislation. The other two main sources: larger plastics breaking down over time, and synthetic microfibers, are where we need to direct our attention now. Checkout 6 ways to reduce your exposure to microplastics below! 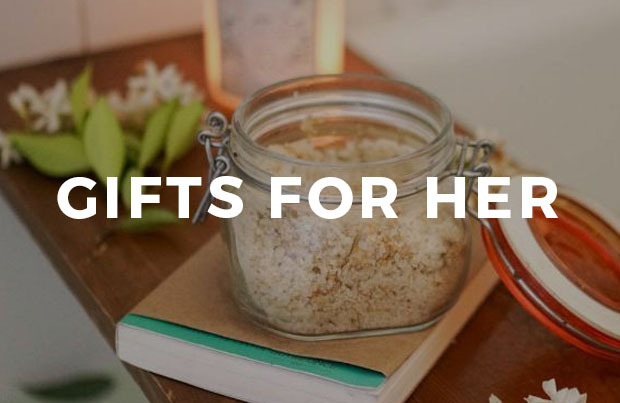 Shop certified organic and non-toxic personal care products! Although the government has banned microbeads in “rinse-off” personal care products, the ban didn’t immediately take affect. The Microbead-Free Waters Act is so recent that products with microbeads were still sold in stores as recently as January 2019! We suggest you play it safe and only shop with brands that are proud to say they’re truly non-toxic. Better yet, look for brands with third-party certifications like USDA Organic or NSF Certified to prove it! 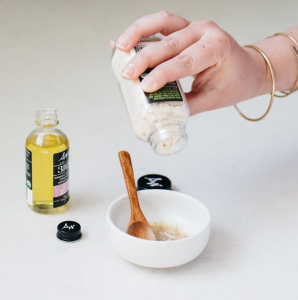 Switch to products with natural exfoliants like walnut shells, clay, or rice grains. If you’re still unsure, check ingredients lists for ingredients like Polyethylene (PE), Polypropylene (PP), Polyethylene terephthalate (PET). Reduce your overall plastic consumption, and therefore plastic waste! As we mentioned above, many microplastics come from larger pieces of plastic slowly breaking down into even more hazardous pieces. That thin plastic grocery bag, over the course of 50 years, will break down into thousands of particles that will never truly biodegrade. By reducing the amount of plastic that you bring into your life, you can help tackle this problem at the source. 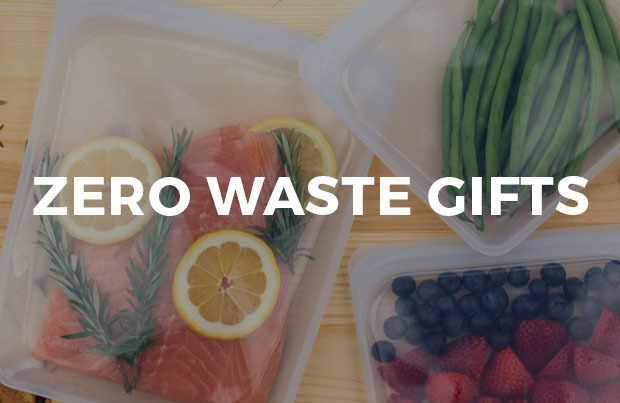 For tips on how to ditch plastic, checkout these blogs! Support small scale plastic cleanups, and large scale plastic cleanups! Whether you’re taking part in a local community beach cleanup, or lobbying to your local politician for more ocean plastic cleanup technology, it’s important to address the plastic that already exists on our planet. Wear organic clothing that doesn’t contain plastic or synthetic microfibers! Microfibers are a maaaajor source of microplastics, and come almost exclusively from non-organic fabrics being washed. Washing machine filters can’t catch these nearly invisible fibers, and they’re easily ingested by animals once they reach our waterways. Instead, buy clothing made from organic sources (think organic cotton, wool, and hemp). You’ll reduce the amount of synthetic fabrics that get washed, and therefor reduce microfiber pollution. Plus, producing organic clothing typically uses less water and energy than synthetic materials! 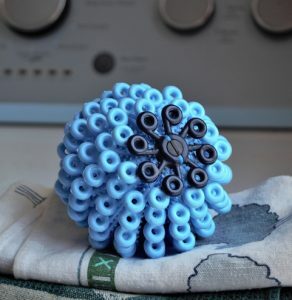 Use a Cora Ball to collect any leftovers microfibers that may be going from your washing machine to the ocean! 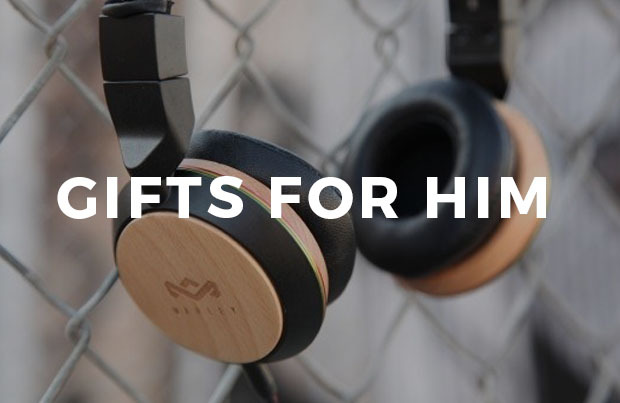 Unless you have a wardrobe made up entirely of organic cotton clothing (we can dream, right?) there probably will be some of those pesky microfibers leaving your washing machine no matter what. That’s where the Cora Ball comes in–a microfiber catching laundry ball made from 100% recycled plastic. Just toss it in the washer with your clothes, and watch as it begins to catch microfibers in its spindles. Then, simply pull the threads out and toss them in the trash. It’s an easy and awesome way to cut down on microfiber pollution in your home. Get yours here! When disposing of small plastic pieces, or any small non-biodegradable waste items, try to contain them so they can’t be easily digested! If you buy a six-pack of soda, you’ll likely cut up the plastic bottle holder to make it harder for animals to get stuck in it. Take this approach and apply it to any non-biodegradable/non-recyclable waste you come across in your life! 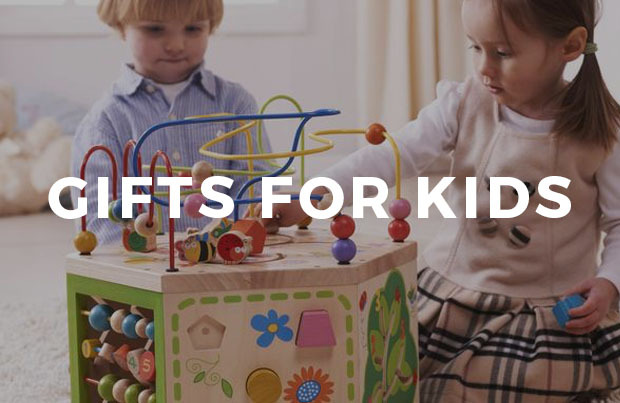 Think of little items like plastic straws, bread twist ties, rubber bands, hang tags from the store, etc. By containing them inside another item, like a plastic bag or enclosed bin, we can reduce how easily they fly away and enter our ecosystems. Next What is Earth Day?